Synthovial Seven® is an oral solution made from premium grade hyaluronic acid with a molecular weight between 2.4 -- 3.0 million Daltons. Hyaluronic acid is a polymer and it can come in varying molecular weights. Studies have shown more benefits with the higher molecular weight HA polymers. New studies confirm that only High Weight Hyaluronic Acid is recognized by and able to be used by the body. 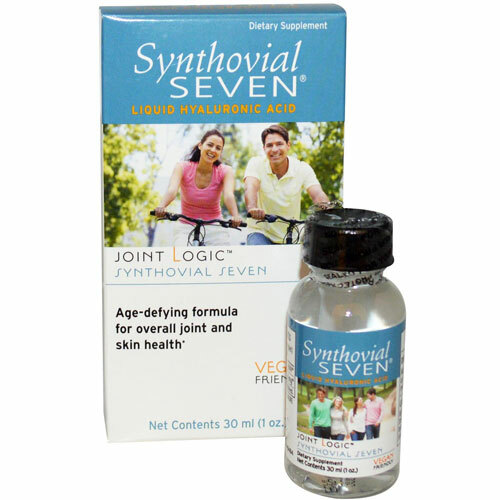 Synthovial Seven is the only High Weight Liquid Hyaluronic Acid Supplement available. Use our patented oral Synthovial Seven® to supplement your body's HA needs. Suggested Use: One dropper full (1 ml) mixed in water taken once per day.